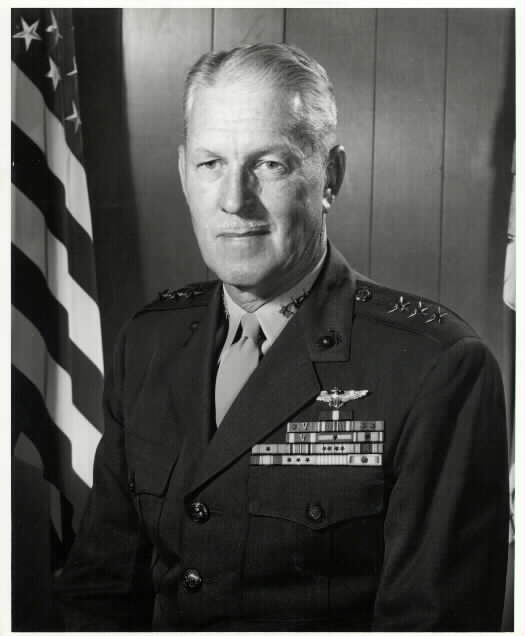 Lieutenant General Richard C. Mangrum, veteran Marine aviator who served as Assistant Commandant of the Marine Corps from July 1965 to June 1967, died September 28, 1985 in Southern Pines, North Carolina. He was buried in Arlington National Cemetery on October 4, 1985. He was born October 27, 1906 in Seattle, Washington, and graduated with the Class of 1928, University of Washington. Commissioned in 1929 following flight training, he served at various Marine Corps stations prior to World War II. General Mangrum was at Pearl Harbor December 7, 1941, and later commanded the first dive-bomber squadron, VMSB-232, at Guadalcanal in 1942. He was awarded the Navy Cross and Distinguished Flying Cross for successful attacks on Japanese naval units. Returning to the United States, he served as Commanding Officer, Cadet Regiment at Naval Air Training Center, Corpus Christi, 1943-1944. He commanded Marine Aircraft Group -93 from May to October 1944, the returned to overseas duty in the Pacific, serving as Chief of Staff, 3d Marine Aircraft Wing until January 1945. General Mangrum was awarded the Legion of Merit as commanding officer of Marine Aircraft Group 45, based on Ulithi, Western Carolina Islands, until October 1945. He returned to the United States at the end of World War II, and was assigned duty in Headquarters, U.S. Marine Corps to re-activate the Marine Corps Reserve aviation organization, serving until July 1948. He was a graduate of the Naval War College Senior Course in 1949, and from 1949-1951, served on the Faculty in the Strategy and Tactics Department. General Mangrum was awarded a second Legion of Merit with Combat "V" during the Korean War, 1951, for duty as Commanding Officer, Marine Aircraft Group-12. Later, he was awarded the Navy Commendation Medal with Combat "V" as First Marine Aircraft Wing Liaison Officer to Headquarters, 5th Air Force in Seoul, Korea, 1952. Returning to the United States, General Mangrum served as Deputy Director, Marine Corps Educational Center, Marine Corps Schools, Quantico, Virginia, 1952-1954. He commanded the Marine Corps Air Station, Miami, 1954-1955, and Marine Aircraft Group-31 (Reinforced) 1955-1956. He also commanded the Marine Air-Ground Landing Force in Atlantic Fleet amphibious exercises before going to Washington in June 1956. Promoted to brigadier general July 1, 1956, he served as Deputy Assistant Chief of Staff, G-3, for strategic plans and Joint Chiefs of Staff matters. General Mangrum joined the First Marine Aircraft Wing in Japan, February 1959, as Assistant Wing Commander. Promoted to major general November 1, 1959, he served as Commanding General, First Marine Aircraft Wing until April 1960. He then served as Deputy Commander, Fleet Marine Force, Atlantic, 1960-1961, and later Commanding General, Second Marine Aircraft Wing, October 1961 to August 1963. General Mangrum was named Director, Marine Corps Educational Center, Quantico, and served there from 1963-1965. On October 1, 1965, General Mangrum succeeded to the title "Gray Eagle" of Naval Aviation, and is the first Marine Aviator to attain this distinction. The "Gray Eagle" is the earliest designated aviator on active duty in the Navy and Marine Corps. General Mangrum was designated a Naval Aviator in August 1929. He assumed office as Assistant Commandant of the Marine Corps on July 1, 1965, and was advanced to the rank of lieutenant general. He retired June 30, 1967 after being awarded the Distinguished Service Medal at Marine Barracks, Washington, D.C.
Other decorations include the Air Medal with two gold stars; the Presidential Unit Citation (twice awarded); and the Korean Presidential Unit Citation.